B & W Window Cleaners provide a traditional window cleaning service. 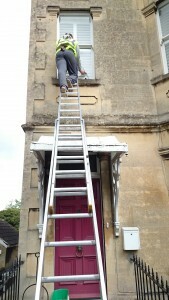 B & W Window Cleaners can provide a reach and wash window cleaner in Bath and the surrounding area. B & W Window Cleaners provide Gutter Cleaning services. B & W Window Cleaners can Clean your solar panels. Are your windows dirty ? Relax, our customers do. Window cleaning can be a big job, not to mention dangerous. That’s why it makes good sense to call in a professional Window Cleaner. When you hire a window cleaner, you probably want more than just clean windows. You want a timely, reliable service from someone who cares about your satisfaction. With B & W Window Cleaners, that’s precisely what you’ll get. 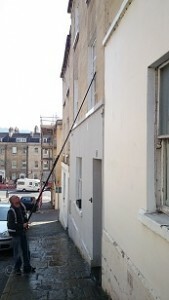 Commercial window cleaning in Bath. Solar Panel Cleaning(Using WFP System). 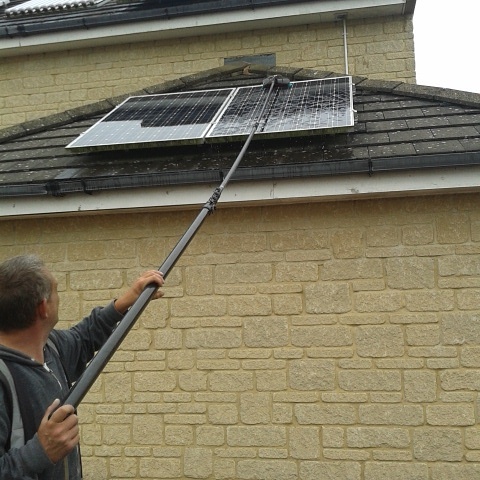 Water fed pole window cleaning in Bath. We are reliable and professional window cleaners with over 12 years combined experience, who are fully insured. We provide our professional cleaning services to clients in Bath, Corston, Saltford, Peasedown, Colerne, Box, High Littleton, Bradford on Avon and many other areas around the out skirts of Bath. We offer both Traditional Window Cleaning and Water Fed Pole Window Cleaning depending on the situation and you the customers personal preference. You can rely on B & W Window Cleaners for a professional AND affordable exterior service. Window Cleaning is our forte, but we also specialize in a total solution for your exterior cleaning needs. Gutter Clearing. If you live in an area where trees are prevalent, as many around Bath do, every Autumn there’s a good chance the gutters and down pipes will get blocked, which could, if not cleared can cause problems with water backing up. 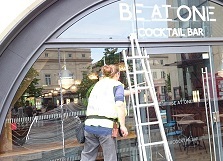 B & W Window Cleaning can take care of this for you, quickly, cleanly and above all safely. Gutter Cleaning. B & W Window Cleaning can bring back the look of a newly installed gutter by using environmentally friendly cleaning methods. Gutters can look like new without having to be replaced. Call B & W Window Cleaning on 01225341990 for a quote for Gutter Cleaning or use our online contact form.